Camino is a Catholic Marriage Preparation Program offered by the Archdiocese of Miami for couple preparing to receive the sacrament of Holy Matrimony. Thousands of couples have attended our two day (weekend) retreat during the last 47 years. This weekend experience helps couples have a happier and healthier marriage both practically and spiritually. Speakers give presentations related to ways couples can improve their marriage. Camino is offered every month at (SEPI) Southeast Pastoral Institute. All are invited to participate. The cost is $125 per couple and this includes your lunches snacks and workbooks for both days. To register please click here at www.caminodelmatrimonio.org, then select a date for your class and pay online. Recommended time to take this retreat is 6-8 months before the wedding, this way you can learn and practice these new techniques before your wedding. If you wait too long to sign up for this retreat, you may run the risk of this retreat being full. Getting prepared in advance gives you time to enjoy this beautiful preparation process. Also, if you present your Camino del Matrimonio completion certificate at the courthouse, you will receive a discount on your civil marriage certificate. Sympto-Thermal Method of NFP: Couples may attend a three-part series (once a month for three months) of introductory classes offered by the Couple to Couple League to learn more about this medically safe, morally acceptable and highly effective method, both for postponing and achieving pregnancy. St. Gregory the Great, Plantation: April 6, May 11, June 1, at 9:30 a.m. Contact Carlos and Victoria DeBayle: 786-302-2116, victoriadebayle@gmail.com. Camino is a Catholic Marriage Preparation Program offered by the Archdiocese of Miami for couple preparing to receive the sacrament of Holy Matrimony. Thousands of couples have attended our two day program during the last 47 years. This weekend experience helps couples have a happier and healthier marriage both practically and spiritually. Speakers give presentations related to ways couples can improve their marriage. All are invited to participate, cost is $125 per couple and this includes your lunches snacks and workbooks. 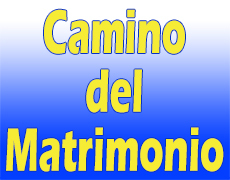 To register please click here at www.caminodelmatrimonio.org , then select a date for your class and pay online. Recommended time to take this retreat is 6-8 months before the wedding so you can learn and practice these new techniques before your wedding. Also, if the retreat is taken two or three months before the wedding you may run the risk of this retreat being full. Getting prepared in advance gives you time to enjoy this beautiful preparation process for your big day when you make this special promise at the altar. "Transformed in Love" es un excelente programa de preparación matrimonial, creado por diferentes expertos para ayudarlo a prepararse para el día de su boda y comenzar a construir su matrimonio sobre una base sólida. Este es un programa oficial de la Arquidiócesis de Miami. Esperamos estar con usted los días 8 y 15 de junio, 2019 de 8:30 a.m. a 5:30 p.m.
"Transformed in Love" is a great marriage preparation program created by many different experts to help you prepare for your wedding day and to begin your marriage by building a strong foundation together. This is an official Archdiocesan program. We are looking forward to being with you July 13 & 14, 2019 from 8:30 a.m. to 5:30 p.m.
El programa Matrimonio 2000 es para parejas que llevan años de casados por lo civil y no han recibido el Sacramento del Matrimonio (Convalidación). El programa, en el que participan parejas de las distintas parroquias de la Arquidiócesis de Miami, es de un día de duración y se realiza en la iglesia Saint Timothy de 8:15 a.m. a 5:30 p.m.
Inscríbase enviando un mensaje de texto al 305-733-7136 con el nombre de la pareja, los años de matrimonio o convivencia como pareja, dirección postal y teléfono. Para más informes, llame al 305-821-0002. ¿Por qué esperar más por el Sacramento que ustedes desean recibir y Cristo y su Iglesia quieren brindarles? Camino is a Catholic Marriage Preparation Program offered by the Archdiocese of Miami for couples preparing to receive the sacrament of Holy Matrimony. Thousands of couples have attended our two-day program during the last 47 years. This weekend experience helps couples have a happier and healthier marriage both practically and spiritually. Speakers give presentations related to ways couples can improve their marriage. Camino is offered every month at (SEPI) Southeast Pastoral Institute. All are invited to participate, cost is $125 per couple and this includes your lunches snacks and workbooks. Recommended time to take this retreat is 6-8 months before the wedding so you can learn and practice these new techniques before your wedding. Also, if the retreat is taken two or three months before the wedding you may run the risk of this retreat being full.Getting prepared in advance gives you time to enjoy this beautiful preparation process for your big day when you make this special promise at the altar.